BlackBox Provide high quality game server hosting. 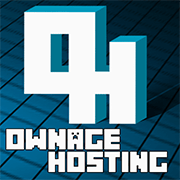 Check their services out if you'd like to find a good game server host for your minecraft server. ServerMiner is the number one choice for hosting your own Minecraft Server. They give you total control over your server and include awesome features such as player tracking graphs, instant mod-pack installer and much much more. Join 1000s of other gamers using the button below. ZAP-Hosting.com is hosting high quality Minecraft servers, gameservers, Teamspeak servers, VPS, root servers and more. Our comfortable Webinterface makes managing your server and installing mods a simple task. With DDoS protection! Server locations in North America and Europe. Here at PandaServ we are focused on the best minecraft experience for your server and players, we offer a large range of servers - from having both budget and premium plans to fit your needs. We also offer amazing support for your needs from pre-sales to support with your servers after purchase. We help you grow your server with having up to date panels, server versions and with fast support to help you with your server. DiscordBots.org is the largest resource to find Discord bots and servers, as our entire userbase is on Discord we decided to partner with this incredible website as we both have similar efforts in helping people find resources for a platform.